GREY’S ANATOMY made history and won the night. ABC: GREYS ANATOMY, now the longest-running medical drama in US TV history, slipped 0.1 to 1.6. The season finale of A MILLION LITTLE THINGS was steady at 1.1, and impressively was also steady with last fall’s season premiere (on a Wednesday). The season finale of HOW TO GET AWAY WITH MURDER gained 0.1 from last week to 0.6, but dropped a heavy 0.4 from last year’s finale (which was itself down 0.4 from 2017). NBC: THE TITAN GAMES season finale lost 0.1 to 1.0. BROOKLYN NINE-NINE (0.7) and WILL & GRACE (0.6) were each down 0.1. The night ended with a rerun of the pilot of THE ENEMY WITHIN at 0.4. 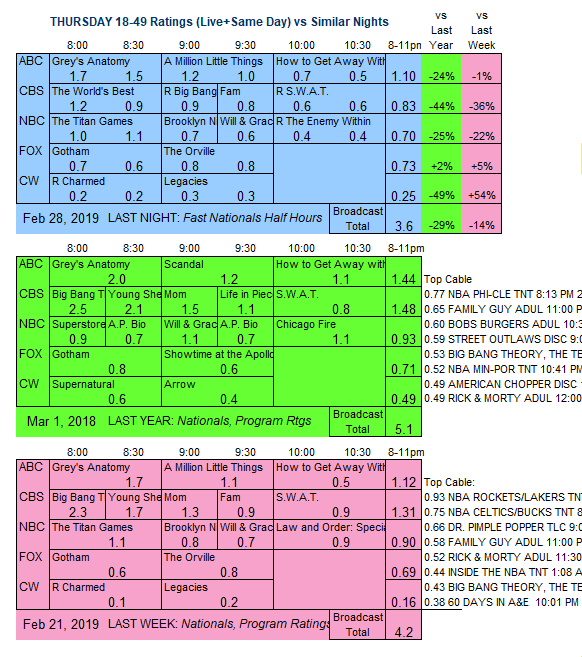 FOX: GOTHAM (0.6) and THE ORVILLE (0.8) were steady. 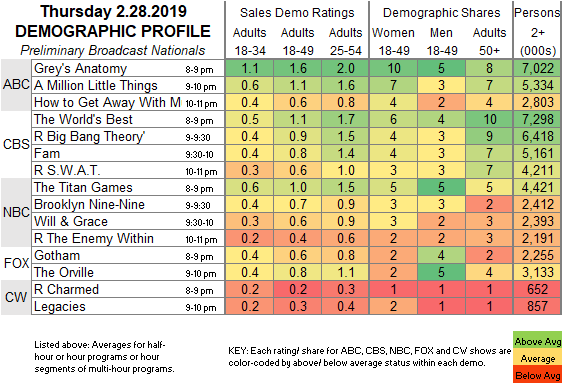 CBS: It appears that our charts are wrong, and the 8PM hour was filled by reruns at 1.2/0.9, followed by another rerun at 0.9. The only new show of the night was FAM, down 0.1 to 0.8. A SWAT rerun ended the night at 0.6. CW: After 0.2 for a rerun of CHARMED, a new LEGACIES gaiued 0.1 to 0.3. Tonight’s broadcast line-up is heavy on preemptions and reruns.